Who should do the indexing? You. The big finger is pointing directly at you. 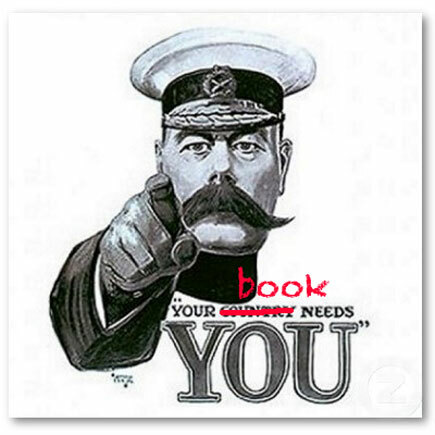 Just as probably it was you who had to key the copy-editing changes, you who maybe got to help design the cover, and you who definitely had to do the proofing, so too is it you who’s now expected to index your book – and in double-quick time. This need not be so. No one is forcing you, personally, to do the indexing. After all, this is skilled work and you may not feel up to the task. You could instead hire Anthony, an indexer we’ve used on several occasions when the author was unwilling and had the cash to hire a professional. Anthony is reasonably priced (surely he cannot live off these earnings) and not only does he turn out good indexes but also – in effect and free of charge – he gives the book another proofing; tacked onto his indexes is a page or two of comments about errors and discrepancies that he’s found in the text. In short, a professional indexer like Anthony could be just what you need. People like Anthony cost money, you cannot be sure you are hiring a good indexer, and they may not be available when you need them. Moreover, an outside indexer has no hope of ever knowing your book as intimately as you do. And, if it is you to do the index, then you can make an early start and refine the index as editing and typesetting progress. It has the added advantage that you can work with the mind map described in my previous post. Definitely, this issue is something to think about carefully and to fully investigate in good time. When will you deliver the proofs for indexing? What is the indexer’s deadline for finishing the job? What is the agreed price? 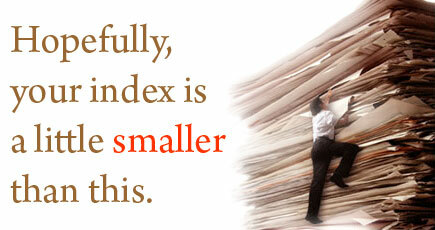 How long should the index be? Is it only one index required or several? How many levels should it have? How should the entries be formatted? Are there any special considerations to note? If, however, you decide to do the job yourself, then prepare a clear indexing brief for yourself, too. You’ll also benefit from taking note of the other issues and advice found in my following posts. And whatever else you do, do not skimp on the job. A poor index signals to the reader that this is an inferior book. Do not fail your book at this last hurdle, mere days before it goes to the printer. A few weeks ago, I wrote about the mental shift required of authors in the transition from editing their manuscript to typesetting their book, of the need to let go, give their book its freedom. However, sometimes this shift only truly comes at the proofing stage when the author suffers a rude awakening about what changes are actually allowed. Suddenly, there is heard the discordant sound of money being demanded with menaces. Today, more likely than not, the typesetter of your book isn’t someone beavering away in a dungeon beneath your editor’s executive suite. Rather, he is a freelancer whose office looks out on cows and crops somewhere out in the countryside or an employee of one of the big Indian outsourcing firms in an industrial park on the outskirts of Chennai. Either way, the typesetter is paid for his work – and often on a per-page basis, not by the hour. In these circumstances, it is hardly surprising that typesetters try to avoid being saddled with extra, unpaid work by threatening publishers with penalty charges. In turn, to protect itself, the press will seek to pass responsibility for any such costs over to the author. Has your contract a clause something like this? If so, you are in good company. This sort of wording is pretty standard among publishers. Indeed, sometimes it can all get quite mathematical. The terms of a contract may well include a maximum amount of proof corrections that authors can make at the publisher’s expense. Anything over and above that level will be charged back to them. What of course the press is doing here is to protect itself against any extra charges levied by the typesetter for ‘unnecessary’ changes. While most publishers would accept some changes, please bear in mind that alterations to proofs are time-consuming, costly and can introduce further errors. Many typesetters thus charge publishers for every single correction apart from those that relate to fixing typesetting errors, not least those arising from the file conversion, as we have seen. (Not even typos are exempt; after all, these should have been picked up during copy-editing.) Charges can escalate rapidly, and eventually (as seen above) your own pocket could be at risk. Perhaps because she doesn’t feel comfortable with this situation, your production editor is likely to work hard to avoid any possibility of such charges raising their ugly heads. Pre-emptively, she will do this by clamping down hard on what changes you are allowed to make to the proofs. Arguably, this is quite reasonable. The time for resolving ifs and maybes was in the writing phase. Clarifications, restructuring and polishing your text belonged to editing, likewise any last-minute content changes. Thereafter, it is only reasonable to expect that the text delivered for typesetting is final. Consequently, your job now is only to correct any typesetting errors but otherwise to make no changes. That’s all very well and good but, out in the real (scholarly) world, something pertinent to your text may well have happened that absolutely must be mentioned in your book, or there could be typos and factual errors that (true) should have been but were not picked up in the editing process. As I said above, most publishers would accept many such changes but expect that the patience of your production editor will rapidly wear thin. Some leeway will be given with the first, unpaginated proofs but almost nothing with the final, paginated proofs. As for feedback on (and suggested changes to) the page design, something that I raised as a possibility here during the first proofing and that I’ll elaborate on in my next post about the final proofs, expect that here especially you will encounter quite stiff resistance. That doesn’t mean that you shouldn’t still take a step back and look at your book with a critical eye. You can be sure that others after publication will be doing the same. You may not win the argument in every respect but you could still achieve a better look for your finished book. Now is the time for you to advise your production editor of any corrections and other changes to the first set of proofs. As we shall see, there are several ways in which this can be done. At this point, the issue of how many changes you can make may raise its ugly head. This delicate matter is discussed in a later post. At the same time, someone else may be proofing your text. When marking changes to the proofs, follow your publisher’s instructions carefully. 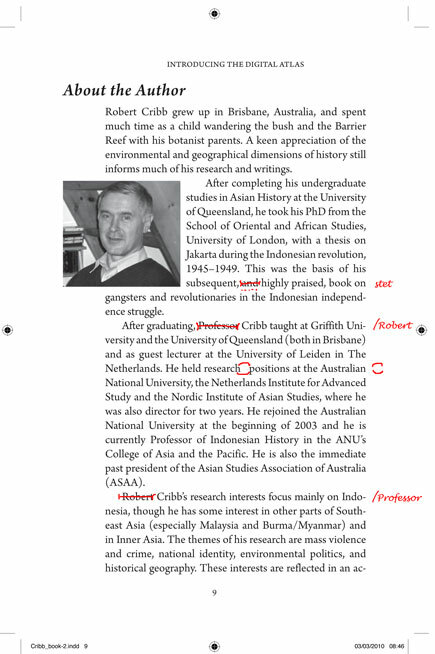 Possibly you will be expected to mark the actual printed pages, using proof-reading marks as in this sample. Some publishers even require their authors to mark the text using a special colour (red ink, for instance). Let’s face it, however, these proofing marks aren’t that easy to remember. Many authors will prefer to annotate the proofs with their own system of marking up. If your production editor is reasonable, this shouldn’t be a problem provided the annotations are clear and consistent. A common alternative to marking up the printed proofs is to prepare a simple list of changes. 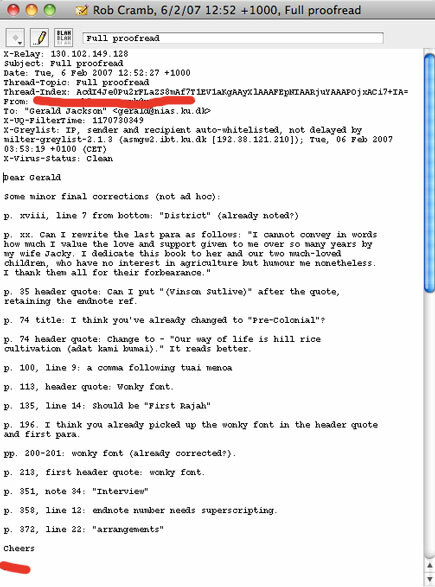 This can be written in a text file and sent to the publisher as an e-mail attachment or even written directly in an e-mail, as in this example. And increasingly authors are using the commenting features now available with Adobe Acrobat and Acrobat Reader (and illustrated here). At the same time that you are preparing your author corrections, chances are that someone else hired by your publisher will be proofing the text as well. This could be an in-house editor, the copy-editor (an attractive proposition as s/he is already familiar with the text) or a professional proof-reader. Again, the results may be advised to your production editor in various ways but the key difference from what you have advised is that the proof-reader doesn’t necessarily know what is correct. Yes, typos and the like can be corrected but often cases of inconsistent spelling/usage can only be flagged up. Thereafter, your production editor will need to reconcile the two sets of proofs to avoid the typesetter receiving contradictory sets of instructions. Obviously, as part of this reconciliation, any inconsistencies in your text spotted by the proof-reader will be referred to you for clarification. Thereafter, everything is returned to the typesetter, who will then begin finalizing the layout of your book and returning a second (usually final) set of proofs.